The item we have listed in this add is a Hughes Performance 1.80 Powerglide planetary with TH400 output shaft. 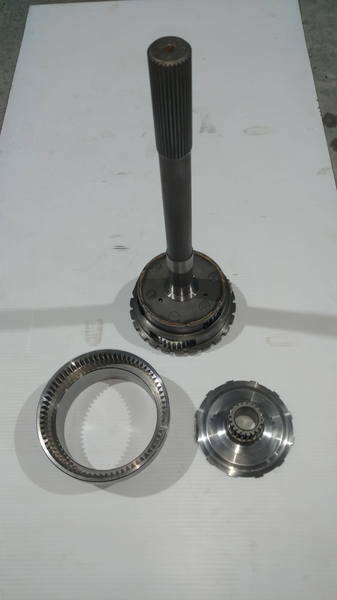 The sun gear and flange gear are set up large diameter input shaft. This planetary is designed for very high horsepower set-ups. Planetary has to be used with a case machined for a TH400 output shaft. We are listing this part for a longtime friend. If you have any questions, let me know and we will try to get you an answer. Based on the visual inspection of the planetary gears it does not look like the planetary has ever been used. Asking price for the planetary with flange gear and reversing ring is $850.00 plus Shipping. All first time customers placing an order with a credit card will be sent a PayPal Invoice that can be paid using the credit card and order must ship to address tied to credit card. If you would like to contact us by phone please call between the hours of 8:00 AM to 7:00 PM central standard time. If we don't answer, please leave us a message on voice mail.